These restrictions only apply to users in the group. The Group Administrator ID is not subject to restrictions. Solo (one user) accounts have no restrictions. The default maximum number of downloads for a Share is 50. After that the recipient(s) will see the message ‘Maximum File Download Reached’. 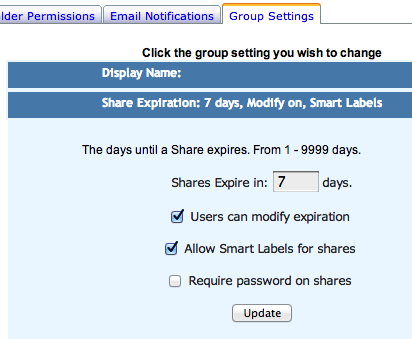 If the number of days to Share Expiration is changed the maximum download limit is changed to 999. If these limits are too low (or too high) contact My Docs Online Support for custom modification.